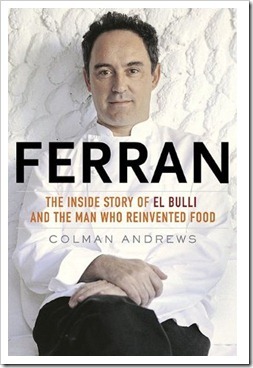 Ferran Adrià is the most influential chef, living or dead, period. He’s also likely the most controversial. At his Catalonia restaurant El Bulli, Ferran has spent the last few decades turning the culinary world on it’s head, breaking rules, toying with emotions, and inventing never-before-conceived ways of imagining food. Unfortunately, you may know Ferran best by his most extreme techniques, which are often implemented poorly by far lesser chefs (yep, I’ve been guilty of that). His most recognizable methods include making foams and turning liquids into encapsulated spheres, both of which quickly denigrate from masterful haute techniques into party gags rather quickly. However, in the hands of (by all accounts) a master/genius/sorcerer/+5000 Mana Food Priest, these methods contribute to a transformative and even transcendent dining experience. Through Colman Andrews’ unprecedented access to Ferran, we learn about his fascinating and serendipitous career progression from military dishwasher to short-order beach bum, eventually becoming the most renowned chef in the world. We also learn much of the history of El Bulli and how the location, landscape and struggling seasonality of the restaurant ultimately contributed to its unlikely success. What we don’t learn, though, is much about Ferran, personally. Although he dispenses a bevy of prolific statements throughout the chapters, nearly nothing is written about his life outside the kitchen, his wife or his relationships with friends. In fact, reading about his many simultaneous projects and ventures, I began to wonder if there was any off-duty time to discuss at all! Skeptics of “molecular gastronomy”, a term which Ferran and others abhor, may find this book less than satisfying – the brief chapter on the opposition to Ferran’s food only lightly grazes the surface of the common knee-jerk responses to modernist cooking, and regrettably does very little to dispel the pervasive untruths that are frequently held against Ferran and his disciples. However, for a geek like me wishing to emulate the patterns and unbounded thinking that made Ferran Adria such a powerful force in the modernist food movement, this book was a fantastic glimpse into the mind of a genius.